this post was created in partnership with saputo! the opinions on this blog, as always are my own. you can follow ingredients by saputo on facebook, instagram + pinterest for more recipe inspirations. as promised, today i am sharing with you my go to breakfast & brunch bake! i love a good strata. they are creamy, cheesy & loaded with flavour. you will even find a strata recipe or two in my cookbook bake the seasons, because they are that good! 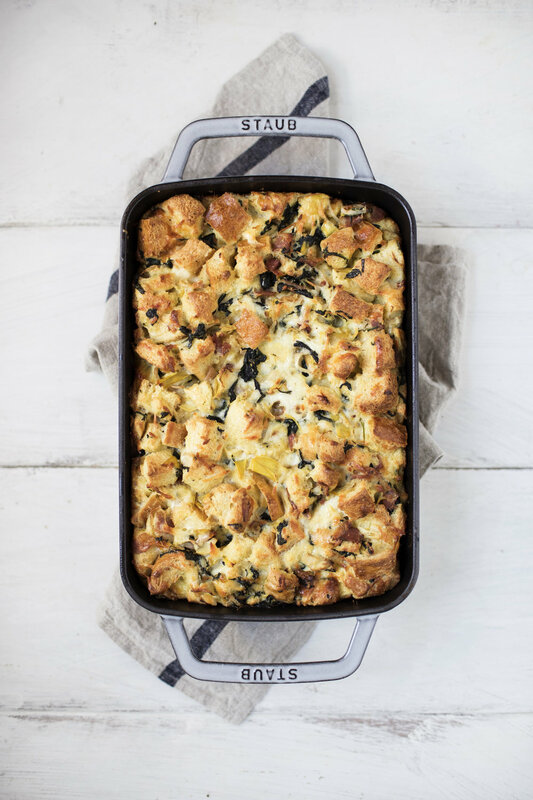 this artichoke + spinach strata is made with bacon (obviously), saputo's mozzarellissima & saputo's parmesan cheese. the mozzarellissima provides the gooey cheeseiness we crave, while the parmesan packs a bold flavour. if you haven't already guessed it, this dish is inspired by the classic spinach & artichoke dip. i just knew those flavours were meant to be paired together in more then a dip. while you can serve this for breakfast or brunch, i also serve it for dinner along side a fresh mixed greens salad. the best part of all? if you are hosting, you can prepare this the night before & bake it fresh before the guest arrive. just like a bread pudding! preheat oven to 350 degrees & grease a 9x12 baking dish. in a skillet over medium heat add the bacon & cook until crispy. using a slotted spoon, transfer bacon to a bowl until ready to use. in the same skillet add the garlic & shallots. cook until the shallots begin to turn translucent, about 2 minutes. add the spinach & artichokes. season with salt & pepper. cook for an additional 2 minutes. remove from heat & let cool slightly. in a large mixing bowl whisk together the eggs, milk, cream & dijon. season with salt & pepper. stir in the cheeses, bacon, spinach mixture & bread. toss to coat. transfer mixture to prepared baking dish & bake for 60 minutes, or until the top is golden brown. serve warm with a sprinkle of parmesan cheese!